The 114-passenger Island Sky differs slightly in internal configuration to her external twin, Caledonian Sky, with The Club and bar above reception on the third (Marco Polo) deck (where premium suites are located on Caledonian Sky). Island Sky's Owner Suites are on the top (Explorer) deck (where the Panorama Lounge is on Caledonian Sky). Seven categories of cabins, spread across five passenger decks, range from Standard Suites (with portholes) to Deluxe Balcony Suites and Owner's Balcony Suites. All of these rooms are almost the same size, but prices vary according to location on the ship and the size of the windows. Cruisers embark and disembark for Zodiac excursions from the rear transom/marina. In 2012, APT purchased an almost 50 percent strategic stake in UK-based Noble Caledonia. The deal saw Noble Caledonia retain control of Island Sky, while APT operates most itineraries for sister ship Caledonian Sky in the South Pacific. Fellow passengers are almost all Brits (apart from a handful of Australians) and almost all 60 or older. They're well-travelled and well-informed, mostly retired professionals with a keen interest in culture. There were a few single ladies on my cruise, as well as a couple of younger women who were accompanying their mothers. Friendship groups formed quickly, as they do when you're on tour all day and dining together at every meal. Almost everybody I spoke with had sailed or travelled with Noble Caledonia before, and without exception, people considered Island Sky as big a ship as they would enjoy. A few had sailed with Viking River Cruises, Star Clippers, Spirit of Adventure and on Noble Caledonia's other trips, while others alternated Island Sky cruises and land-based tours. There was a great sense of fun and camaraderie, and on some nights, the dancing in The Club went on late. Onboard currency is the pound sterling. 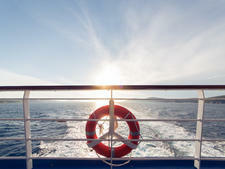 Gratuities are included in the cruise price, and nothing is added to drinks or beauty treatments. Many people, though, said they were going to tip the crew extra, as the service was so good. Hebridean Sky, which underwent a multimillion-pound refit in 2016. Like its sisters, Hebridean Sky is more reminiscent of a smart, country house hotel than a cruise ship, with generously sized cabins, comfortable, informal lounges, a beautiful library and a big deck. 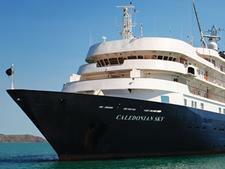 Caledonian Sky originated as a luxury expedition ship under Renaissance Cruises, in the late '80s. It's now widely considered to be one of the best maintained vessels of the defunct fleet.